Mockingbird Trio are a boston-based trio that perform contralto and voila art songs of the 21st century. What a delight to come together with my pals to revisit some delightful 21st century song cycles by Fran Trester and learn some new tunes! Celebrating Scott Woolweaver’s birthday (Mr. Viola to you), John McDonald has written a gorgeous new tune on a poem of Scott’s friend, Cheryl Savageau, called “Equinox”. It’s about a goldfinch, natch, because we are all a bit bird- and nature-crazy in this trio. John plays piano for the rest of the pieces, but this bird song is just contralto and viola and it might rival John’s “The Mockingbird of Mockingbirds”, which was written for a big birthday celebration of mine in 2004. Sunday March 11, 3:00pm Scott’s birthday bash with nice reception afterwards. Free, lots of good music for viola and I will be part of the 2nd half. Includes “Domestic Affairs” by Francine Trester (10 songs on domestic life, including raccoons in the garbage and a bird named Ruffles) and “Equinox” by John McDonald (premier, described above). Friday March 23, 11:00am All-Mockingbird Trio in an informal setting, which includes lunch afterward. $30, reservations required. Program includes Howard Frazin’s “A Wren” and “Lullaby”, song cycles about birds by Francine Trester and John McDonald, his new “Equinox” and “The Mockingbird of Mockingbirds”. Some on poetry by Denise Levertov; Fran writes her own fabulous lyrics. Howard Frazin’s Viola Sonata is also featured (premier, also being heard on March 11 concert). How fun is this? For me, nothing more delightful than singing beautiful 21st century music that was written for me and my pals, on gorgeous texts and getting to play music with them again after a hiatus (John was on sabbatical, after being dept. chair and other grown-up duties). Mockingbird illustration by Lisa French. We’ll be performing a new work by our esteemed colleague Francine Trester in the coming months. “A View from Heartbreak Hill, a cycle of six songs whose themes stem from the events of last year’s Boston Marathon attack. The songs, scored for contralto, viola, and piano are reflections on the tragedy, a memorial to the victims, and an offering of hope. “I wrote the words and music to the cycle – more of my work can be found at: www.francinetrester.com. I think we have an interesting story to tell. The March 2 event at the Newton Free Library will be a full concert by The Mockingbird Trio. More news to come about this special cycle and its premiere. 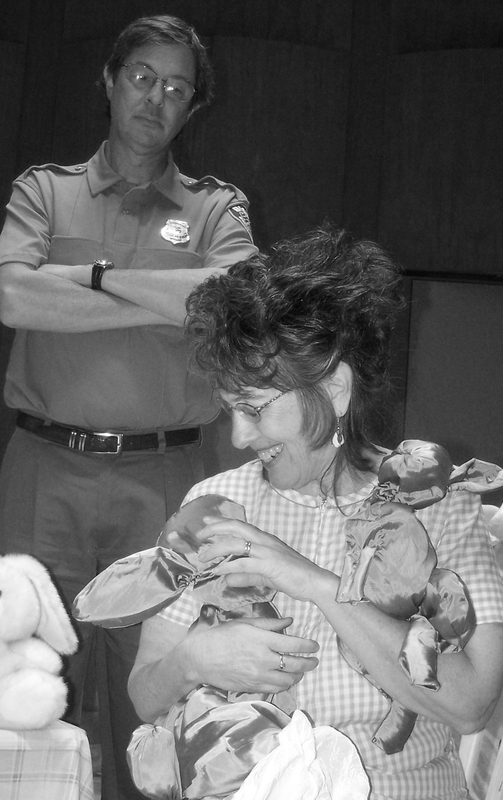 Officer O’Hare is not so sure about Mrs. Ringwald and her bunnies Newsflash!Thursday’s performance of 334 Bunnies January 26, 8:00pm EST will be web streamed from the Longy School. Go to www.concertwindow.com/longy for details. There will be a talk-back after both performances. The entire opera is less than one hour. 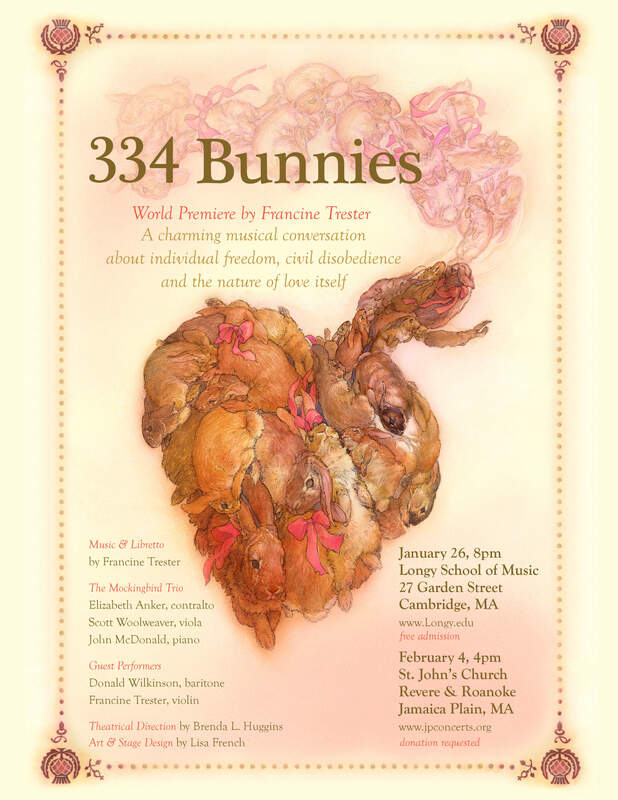 Thursday, January 26, 8:00pm at Longy School of Music, Cambridge. We will also be hopping to Shirley, MA on May 19, 2012 at the Meeting House. Songs about daily life: raccoons in the garbage, messy houses, pets, running late, and of course, love. Music by Francine Trester, premieres by John McDonald and yours truly, French songs of last century by Charles Martin Loeffler (friend of Isabel Stewart Gardner) and others. Based on a true story of an eccentric woman who is visited by a policeman intent on shutting down her menagerie. A lovely, tuneful one-act opera with Philip Lima and Elizabeth Anker, and a trio in the pit, our group plus the composer on violin. With stage set by Lisa French. Saturday May 7, 2011, 4:00pm at St. John’s Church, Jamaica Plain. Repeated at Longy School of Music on Thursday June 9 in the evening.